It’s no secret that people from all across the globe flock to Costa Rica for the weather. With nearly 800 miles of coast, Costa Rica has hundreds of beaches, both on the Pacific Ocean and the Caribbean Sea. These white sand beaches with swaying palm trees and crystal-clear waters attract tourists and locals alike with the promise of a tropical lifestyle. While the beaches fill up quickly, the curious traveler might head away from the beach to discover what inland Costa Rica has to offer. 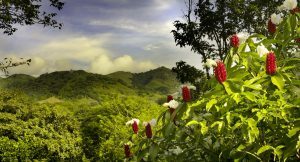 The Costa Rican coast is stunning, but this small country is actually home to 12 distinct microclimates, from cloudy mountains, to rainforests, to rock volcanic area, and some of the best kept secrets lie in these off-shore regions. Atenas, a small town of only 5,000 habitants, is one of the incredible gems Costa Rica hides just off its Pacific coast. The capital of the Atenas canton (or department), Atenas city has been named as the region with the best weather in the entire world. With a title like this, the small city has been adopted by international expats from around the world, most significantly, retirees. This mixture of traditional culture and international influence has created an incredibly diverse, welcoming, and most of all, comfortable environment. Atenas is located between the capital city of San Jose and the Pacific coast. Situated on the western border of the Central Valley, the center of the city is around 700 meters above sea level, but varies significantly throughout the region. Although the city of Atenas only has 5,000 inhabitants, around 27,000 people live throughout the canton. Named after the Greek capital city, Atenas is surrounded by mountains, coffee plantations, and sugarcane fields. New incomers to the city often buy homes located in the mountains surrounding the city, enjoying the spacious views and easy access to a city center. Although incomers have greatly influenced the area, traditional culture and values are still thriving. Atenas hosts farmers markets offering top-tier, locally grown produce at around one third of the cost you would expect in the United States. Hand-crafted jewelry and traditional Costa Rican clothing is produced in the area, making it an excellent destination for experiencing traditional culture and finding souvenirs. Do they really have the best weather in the world? “The best climate in the world” is plastered on every bus and park bench in the city, and this phrase has found its way into countless articles and websites reviewing the area. And it’s not just hype, Atenas truly has the most comfortable weather in the entire world. Atenas maintains temperatures in the 80’s year-round, dipping into the mid-60s as night (typically 31 Celsius during the day and 19 Celsius at night). The temperature and humidity levels are stable year-round, making the area dependably comfortable regardless of the season. The region enjoys moderate temperatures without extreme heat or cold, but still boasts some variations in climate. The Atenas canton starts at about 300 meters above sea level and ascends to 1,200 meters above sea level at its highest point. This spectrum of altitudes creates sub-regions within the canton. This can vary the climate a bit, but the moderate temperatures and predictable weather patterns remain. 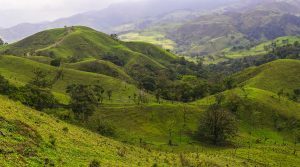 Moving slightly inland and upward from the popular beaches, you are gaining the most comfortable climate imaginable without losing Costa Rica’s tropical charm. Palm trees cover the central park, where people gather to talk, eat lunch, or watch the tropical parrots and toucans fly overhead. The comfortable weather and tropical scenery create a peaceful, relaxing culture, where people stop in the streets to greet friends and sit down for a cup of locally grown coffee. Atenas may not be a booming city, but located just 40 minutes driving distance from the capital of San Jose and just over an hour from the Pacific beaches, you aren’t missing out on much. The culture is welcoming, the scenery breathtaking, and over all, you’ll be enjoying the best weather on earth.